In an ironic twist, the school which features the name of one of Chicago's most well-known union organizers is trying to stop the teachers from forming a union. Recently, the teachers at the "Rudy Lozano Leadership Academy" voted to form a union at the school named after Rudy Lozano, a union organizer and immigrant activist who was murdered in the early 1980s. The Lozano Leadership Academy is a small charter school located near where Rudy Lozano was murdered in 1983. 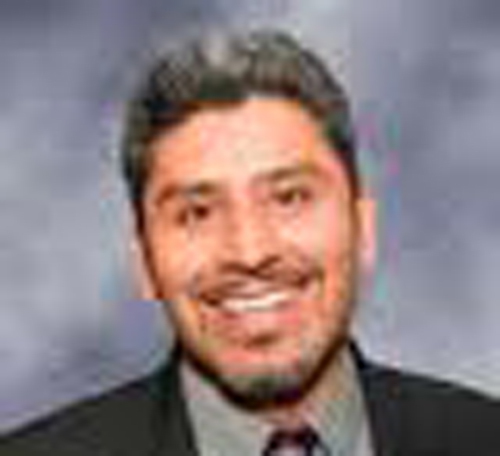 The image of Juan Salgado as a leader of a "Progressive" organization fades like this photograph when he begins to hire union busting law firms to stop the unionization of workers at the Rudy Lozano charter school in Chicago.But Juan Salgado, the director and "Chief Executive Officer" of the Institutio del Progresso Latino which oversees the charter school, has taken the teachers to court because he does not want the charter school to be recognized with a union, according to the Alliance of Charter Teachers and Staff or ACTS, which helps charter school teachers form a union. Salgado employed a law firm which specializes in "union avoidance" and held meetings with teachers and filed a challenge with the National Labor Relations Board, according to ACTS. "The irony," the teacher wrote further, "is that our school Rudy Lozano is named after one of the greatest union organizers the city of Chicago has ever seen. There is talk of Juan running for congressman." According to its website, the Rudy Lozano Leadership Academy at 2570 S. Blue Island, was founded in 1996 and is housed in the Institute for Latin Progress. The school is affiliated with the Youth Connection Charter School. It is a three-year alternative high school serving 109 students ages 17-21, mostly hispanic youth from the Little Village, Back of the Yards and Pilsen neighborhoods. Chicago ACTS, an affiliate of the American Federation of Teachers or AFT, is helping charter teachers across the city to unionize. They recently helped to unionize teachers at four Aspira charter schools, three Chicago International Charter schools and the Chicago Math and Science Academy - CMSA. CMSA had earlier fired a highly regarded pregnant teacher who helped organize a union at the school in June and challenged the teachers' right to form a union. CMSA, which also hired a prominent anti-union law firm, had argued that the teachers could not unionize because they are a private entity. However, the state labor relations board ruled that the charter school is a public school with public workers who are governored under the Illinois Educational Labor Relations Act, ACTS reported. Chicago ACTS currently represents eight unionized charter schools in Chicago. A pathetic act to put an end to his and a great activist heritage. I knew Rudy (well); we worked together on a number of important community issues. He would have fully supported unionizing of teachers at the school. The facts in this article are wrong. First of all the teachers did not Vote to Unionize. In fact, if the person who wrote this article knew anything about Labor law they would know that the IDPL is actually asking for a vote via the National Labor Relations Board so that the teachers can truly understand the truth about Unions. If everyone thinks Unions are about helping people and teachers, they are wrong. They are also about ensuring that they recieve money for themselves so that the business managers and recruiters for the Unions can afford nice cars and fancy offices. I would like to know where everyone thinks the money is going to come from to pay the extra fees to the Union. Certainly CPS is not going to provide a higher per pupil funding to any charter school just because they have joined a Union. I am sure that Rudy Lozano would also understand that times have changed and that the whole purpose of Charter Schools was to change the model of the bueracracy that Unions bring to education. Don't fall into the trap of believing that the Unions are trying to help the teachers. Si Se Puede! Thanks for the post Paul... at least now we know that at least one champion of Rudy Lozano Charter School is an anti-union ideologue. Mr. Campos wonders where the money for 'extra fees to the union' is going to come from. The question implies that it will come from the kids who the school is supposed to be serving, or, for that matter, from the teachers themselves. The unstated but clear implication here is that the union is an outside force, some third party with its own, outside interests—fancy cars, nice offices, etc. Please. Campos uses the same argument that anti-union lawyers and employers made back in Rudy Lozano's day—the union is just a bunch of outside agitators. Good loyal workers don’t need union. The reality is that the teachers union is not some group of outsiders—95% of the leadership of the Chicago teachers Union are classroom teachers or PSRP’s from Chicago—and most of us put in decades in the classroom. Can the same be said for the leadership of the Charter School Movement? Perhaps charter schools are saving money by denying teachers family benefits, not paying for pensions, requiring Saturday work without compensation, etc. Never mind that this undercuts the standards in the field and contributes to a sky-high turnover for teachers in the charters. Where is the money for better teaching conditions going to come from? Perhaps it should come from expensive anti-union attorneys, from for-profit EMO’s, or from the multi-million dollar advertising and self-promotion budgets that charters use to attract students. Stop trying to dress up right wing, anti-union arguments in the language of the movement. Tens of thousands of LA janitors and office workers brought the phrase ' Si Se Puede' into the national consciouness, and firmly associated it with the labor movementor in the Justice for Janitor’s campaign.